Determine the osmotic pressure of water. Demonstrate the Van ’t Hoff equation. For each concentration, measure the conductivity and permeate and concentrate flow rates. Determine the overall NaCl retention of the module. Determine the NaCl conversion rate. Compare the qualitative and quantitative yield. 1 200L polyethylene tank with removable lid, isolating valve and draining valve. 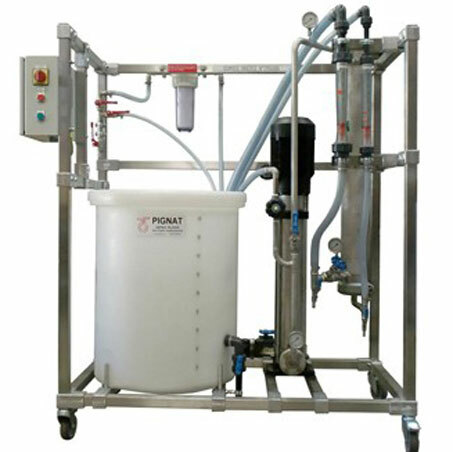 Raw water feeding with cartridge filter. Copper coil for cooling fluid circulation and isolating valves. Stainless steel multi stage centrifugal pump 0 to 20 bar , flow rate 4-12m³/hour. Isolating valve and pressure gauge 0-25 bar on the discharge pipe. Stainless steel casing, polymer filament membrane. feeding section and adjusting valve. Float flow meter, 64 to 640 L/hour. Float flow meter, 300 to 3000 L/hour.